Further torrential rain in the night! Spent the am doing a service wash! After lunch walked in to the centre of Rochefort. Visited the Corderiere Royal - a massive rope museum on the site of the workshop built by Louis X1V to support the massive ship building yard nearby. In it's day it provided rope for the sails etc for warships built in the dockyard, the centre of naval shipbuilding in France in the X1V C. It was an interesting museum with demonstrations of how the rope was made and also had a section with how the sea is depicted in comic books and animated film in France. Moored nearby was the l'Hermione, a replica of the 14c warship La Fayette. 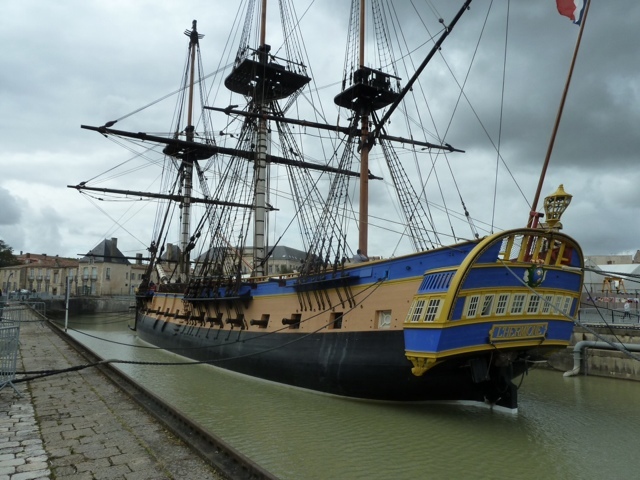 L'Hermione has taken 17 years to build by 73 artisans and only just recently launched and crossed the Atlantic to celebrate the original's involvement in a famous battle. The original La Fayette took 6 months to build by about 600 people. During the recreated voyage just about 20 crew were professionals the other 50 or so were volunteers. The crew in the 14c La Fayette numbered in the hundreds. Both voyages took about 35 days. Rochefort is an interesting town on the estuary of the River Charente. Would recommend a visit. A leisurely drive down to Saintes. Did a big shop at an enormous Hyper U supermarket and then lunch chez Rex waiting in the car park of the municipal campsite until 3pm to be allowed on to a pitch, - such excitement! Cycled in to Saintes for a reccy - will return tomorrow for a sightseeing day. Dinner chez Rex and watched the TV - Rugby World Cup - England v Fiji. The french TV people were going nutty with extensive pre match coverage - goodness knows what it will be like tomorrow for France's first game!! Further rain in the night! This is NOT what it is supposed to be in this land of milk and honey! Walked in to Saintes . First port of call the Roman Amphitheatre. This weekend in Charente Maritime all museums are free - result! 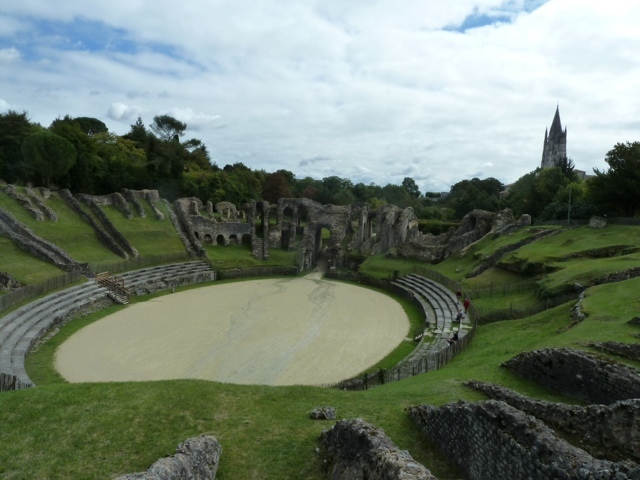 The Amphitheatre is probably the best of it's kind in Europe. Very impressive. The english speaking audioguide was excellent in informing how life would have been in the 1st C AD. Walked back in to Saintes centre to the Archeological Museum for a further Roman fix - gratuit merci. Arrived at a nice bistro just as they stopped serving food so carried on looking for somewhere open and ended up in a cafe near the tourist info with great views of the ginormous L'arc de Germanicus (roman) and ate a nondescript cheese on toast thing. Then on to the L'abbaye aux Dames an old Cistercian abbey also free to visit today! There was a marriage service just starting as we arrived and the sound of singing from within the abbey church was lovely. However as it was a Catholic service ( presume lengthy) didn't hang around to see the happy couple emerge from within. Bought a couple of books from a street bookstall as we walked back to the site - hardback pictorial guides to Charente Martime - as a start to the info corner of La Maison Pierre - yes getting a little ahead of ourselves here! Returned to the campsite - it has not rained so far today - hurrah! Will dine Chez Rex and watch the Rugby in solidarity with our French amis! We have an appointment on Tues with the Notaire in Surgeres to start the official house buying process and will then have 10 days cooling off period before reaching the point of no return! Rear half of the lounge overlooking the garden. From dining room open to hall to lounge. Other pic of lounge was of the back, to the right. Called by the vide grenier/brocante before leaving Saintes. Unfortunately it was all Graham expected with mostly tat, old clothing, shoes and toys and not the undiscovered art deco gems that Carol hoped for! Stopped for lunch at the pretty riverside town of Jarnac- the celebrated birthplace of Francois Mitterand, and had a picnic in a park overlooking the river, canal locks and the Corvoisier cognac centre. Very peaceful and picturesque. Weather sunny and all well with our world! And then on to Pons ready for a viewing tomorrow. Settled on to the municipal site then walked in to town to check it out before dinner chez Rex. The area around the Donjon with it's Cafes and square is lovely but the town does not feel as nice as Surgeres - the house tomorrow needs to be pretty special! Met John the estate agent who will be showing us houses this am. We only booked to view 1 but apparently we will view another 2! 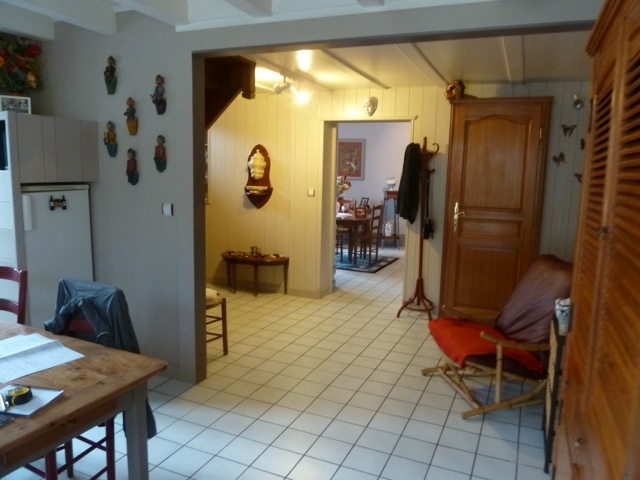 The first propery was a lovely detached traditional house in Archiac, a large village near Jonzac. It faced a tabac and pharmacy with a glancing view of the church. 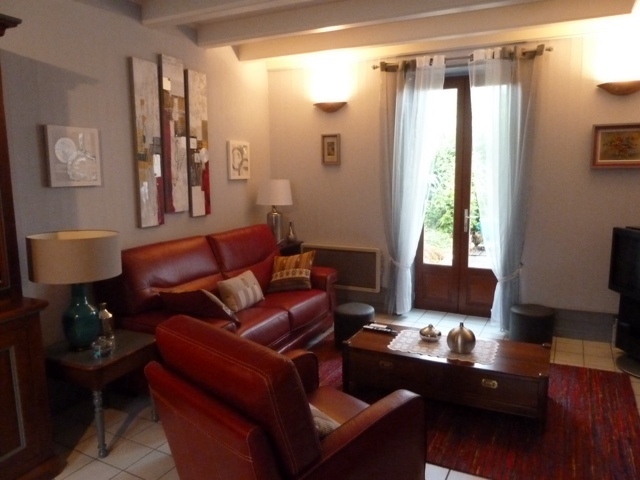 It is the holiday home of a notaire who has retired to an appartment in Bordeaux. Very grand inside but the usual pokey kitchen. Upstairs 5 bedrooms and 2 bathrooms - 1 shower room, 1 bathroom neither with WC and 1 WC all along the same corridor - weird! The house had further rooms unused and also access to another attached small house needing renovation. A rather grand pool and enclosed walled garden outside. Again probably more suited to someone with a larger budget and more imagination than us. So we were "out". The next house was a strong contender - walking distance from Pons centre. However, disappointment loomed over us again - another overpriced home needing almost total renovation. Again lovely outside space but inside - oh dear! Again all bathrooms had no WC - with only 1 seperate WC for the whole house of 4 beds. Again an air of slight decorative neglect. Sorry John we're "out"
The final property was in a suburb of Pons definitely not within easy walking or even hiking distance from the action! It has been empty 2 years since the owner returned back to the UK following the death of his wife. A large modern spanish style property - not to our taste - which had a rather sad air of abandonment. Again a lovely outdoor space with pool and summer kitchen. However - location,location,location - we were "out". It was well overpriced too! 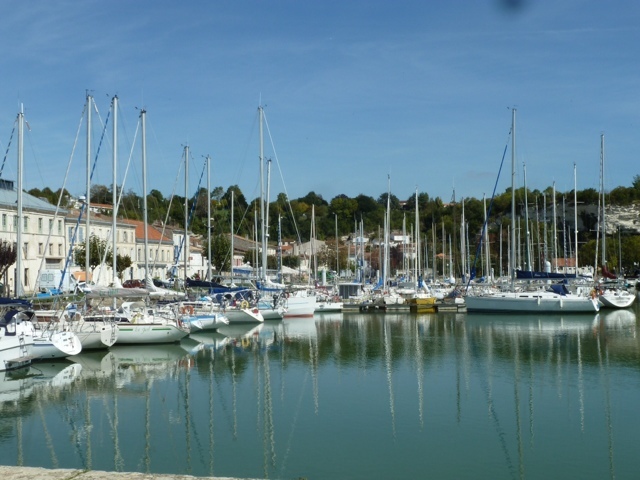 After the resigned John dropped us back to pick up Rex we motored on to a lovely picturesque village on the Gironde estuary called Montagny sur Gironde. Had a picnic lunch overlooking the small marina. 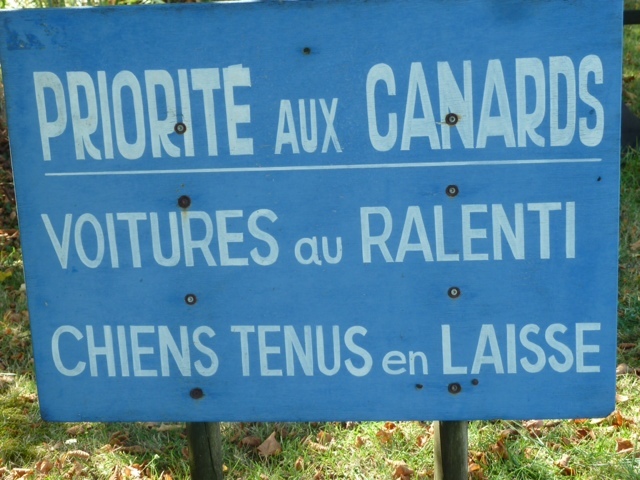 Ducks have priority over cars in Mortagne. Here also was an Aire for motorhomes - where you can park overnight for 8€, and outside for free. But you have to be quick or lucky - there is limited room. We were lucky. As we picnicked a stream of hopefuls having missed the boat as all pitches were already taken at 2 pm circled and drove on by. We continued to drive up the coast admiring the views and enjoying warm sunshine. We overnighted in Marrennes - the oyster capital of France . However the weather did not hold so the splash in the pool at the site did not materialise. We also heard from Ingrid the agent - our appointment to sign the contract is now to be Weds am. Another rainy day so headed to Rochefort for a day killing time of supermarket and furniture store mooching. Unfortunately what we thought was a furniture store was the french equivalent of BM homestores or a cheaper Dunhelm mill! No design ideas to be had! We decided not to stay in Surgères again, but headed onto Courçon on the edge of the Marais Poitevin - however rain stopped play so had a supermarket ready meal chez Rex and an early night ready for the big day tomorrow. Weds 23rd Sept - the possible day of no return! Met Ingrid at her office,then off to Rochefort to sign the contract. As she drove us Ingrid informed us 2 other buyers were wanting the property since we signed the pre contract- we are now so glad we turned back and signed so quickly and feel much better about offering the asking price- for once it appears luck was on our side! Ingrid says there is a lack of quality housing in Surgères. Estate Agents can draw up the initial contract and this was Ingrid's 1st time with a house purchase. There was another estate agent colleague, a translator who worked for the same agency who was a fluent french speaking english woman. Monsieur the vendor and ourselves. There followed over an hour of paper signing extraordinaire and talk of termite inspections, electricity inspections, asbestos and house eating mushroom inspections - all mandatory and funded by the vendor, then the job was done! The translator informed us of some jobs needing to be done identified in various surveys - apparently there is woodworm in the loft and garden shed - " quite normal in old french houses", a possible problem with the electric trip-" an electrician will just fix it" and hopefully that's it! Eeek! We shook hands all round and Ingrid treated us to lunch with a glass of wine at a brasserie, where we sat and ate al fresco in warm sunshine- how civilised! We then went back to Surgeres where Ingrid accompanied us to the Mairie to enquire how to commence the planning process for a swimming pool, and also to the Tourist Information Office to obtain their list of holiday rental properties available in Surgeres (to suss out the opposition and possible friends. One English couple appear to have a several gites in a hamlet just outside of Surgeres - may be worth contacting them for info re pool companies and other tips? Went to the bank to pick up our new bank card and cheque book and on enquiring re home insurance got booked in to see Geraldine the manager for an interview in a few days time, - no handing over of info leaflet here - oh no a thorough interrogation will be required! Decided to move further inland for a few days and so headed for Chef Boutonne - to La Moulin campsite - which has a restaurant in a former mill. Greeted in english by the caretaker and on talking to a fellow camper discovered this was an English owned site in an enclave of English expats! We had passed a white van with a catering box attached parked in a car park as we had approached the campsite. We were intrigued as it had lettering on it stating a Chatsworth address. Apparently this was the mobile fish and chips van! Had dinner in the restaurant served by the owner - weird ordering french food in english - at least the chef was french! Stuart the owner advised us re pool buying almost trying to put us off - but we will not be deterred! As we chatted to Denise and Ray at the table next to us - we ordered some wine - chosing a bottle rather than the cheaper carafe from a wine box. Ray had ordered this when they had dined here previously and asked Stuart what is was and where to get some. Stuart had described it as Chateau Plastique, and so on visiting the local cave a day or two later Ray asked for a bottle of Chateau Plastique, only realising he had been the receipt of a Stuart witticism when the shop owner handed him a wine box! Doh! Oh how we laughed -poor Ray! After a typical french very tasty 3 course meal at the cost of €17.50 pp (£13), and a couple of celebratory bottles of wine (keeping up with Denise and Ray just to be polite), we staggered back to Rex to watch the 2nd half of the french game in the rugby world cup. The champagne will have to wait until tomorrow! Congratulations for your purchase!! What a wonderful news! Enjoy the rest trip! !